How could I travel to Amsterdam and not make a day trip to Belgium? Brussels is the chocolate capital of the world, and is only a 2 hour train ride away. Chocolate shops are liberally sprinkled throughout the city center, making it almost impossible not to spend an afternoon hopping from shop to shop, in search of the most delicious Belgian chocolate. That, friends, is precisely what I did. I limited my search to 5 shops because, I do have some self-restraint. Also I had a train to catch. No Godiva or Leonidas, because they are so easy to find in the U.S. 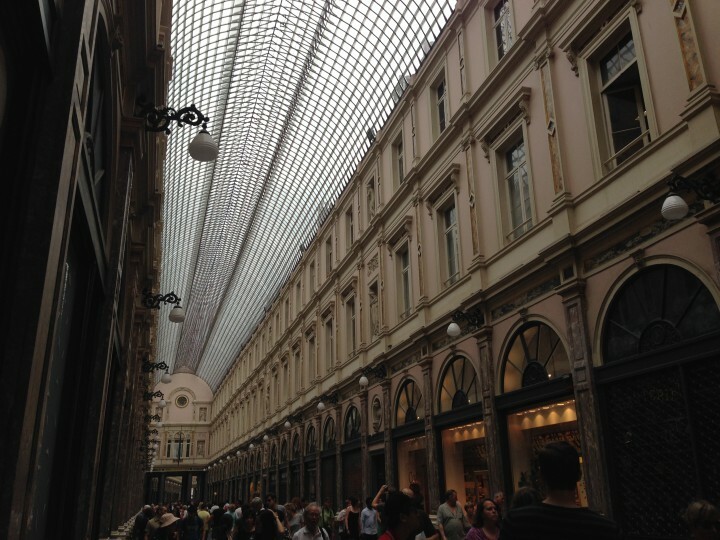 I started with Mary, on the Galerie de la Reine in the Galeries Royales Saint-Hubert. 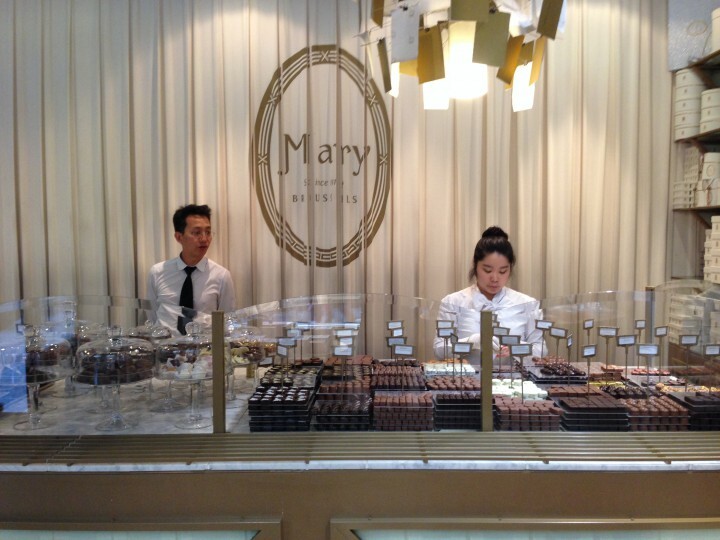 Mary has been in operation since 1919 and is said to be the preferred chocolatier of the Belgian Royal Family. They are particularly known for their chocolate covered marzipan, which is a weakness of mine. I selected a small square. 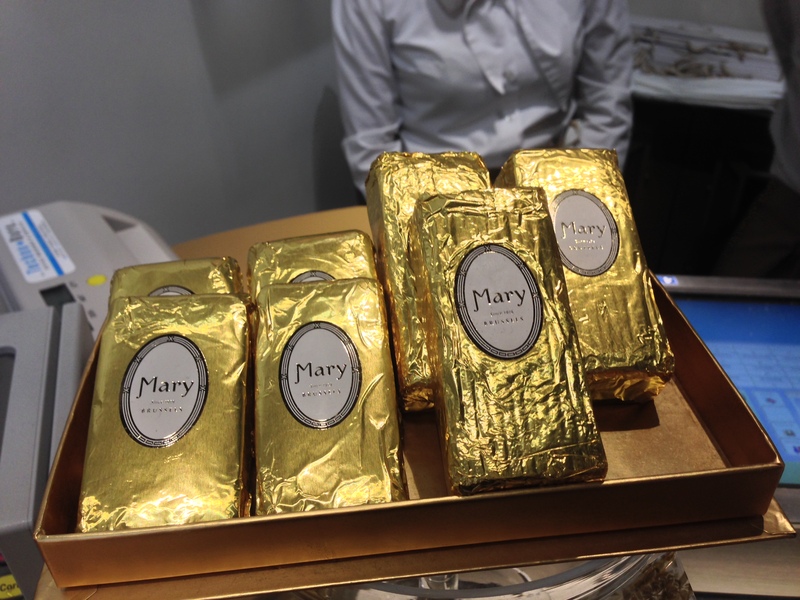 I am sad to report that the marzipan from Mary was not the best I have tasted. The chocolate was not as dark as I would have liked, and the marzipan was chalky. 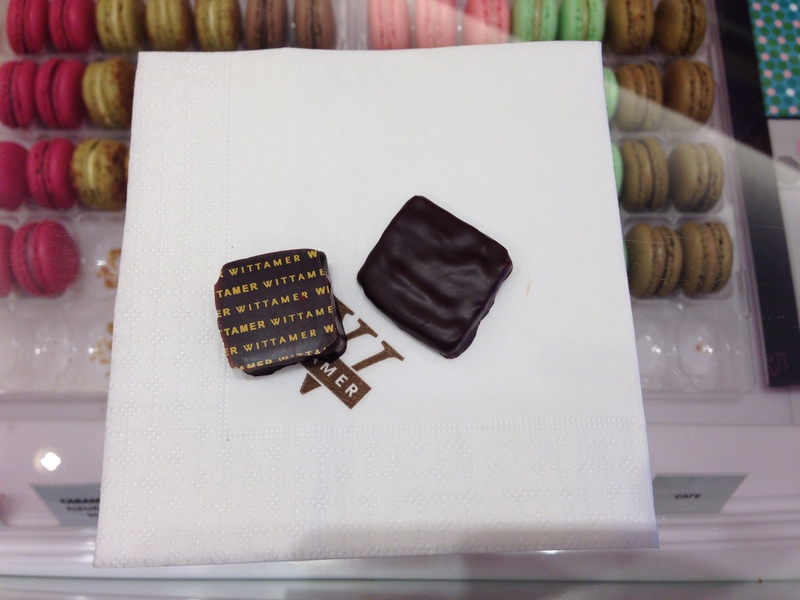 At Wittamer, on the Place du Grand Sablon, I sampled the eponymous ganache–which was 70% dark–and the Feuillantine Noire, a dark praline. The Wittamer was fudgy. The feuillantine reminded me of a Kit-Kat Bar. I found both to be a bit too sweet. My next stop was Neuhaus, just down the road. 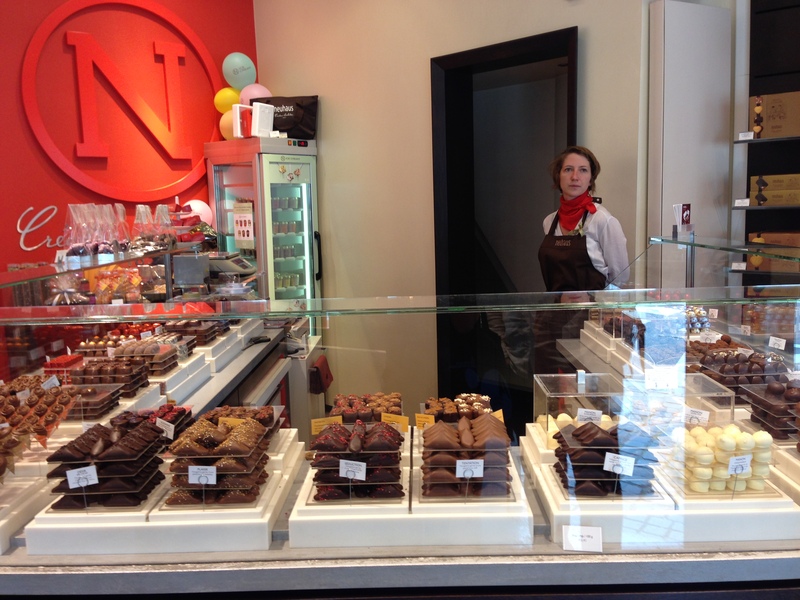 Neuhaus invented the praline in 1912, so the selection there was clear- a Coeur Praliné – almond and hazelnut praline. 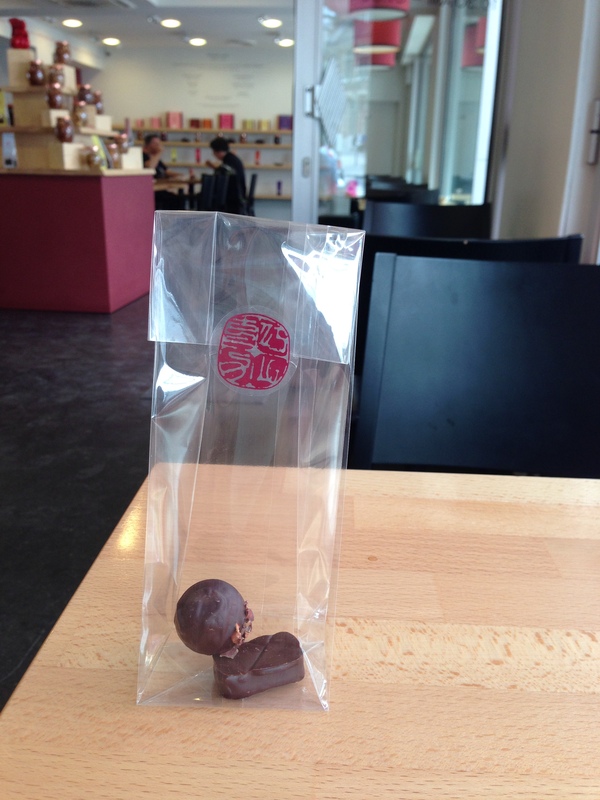 I also chose the Plaisir – nougatine filled with hazelnut ganache. The Coeur was smooth , creamy, and very nutty – almost like peanut butter. I particularly liked the texture, however, of the Plaisir. It was many layered, almost chewy, and the flavors of the individual ingredients sang through. 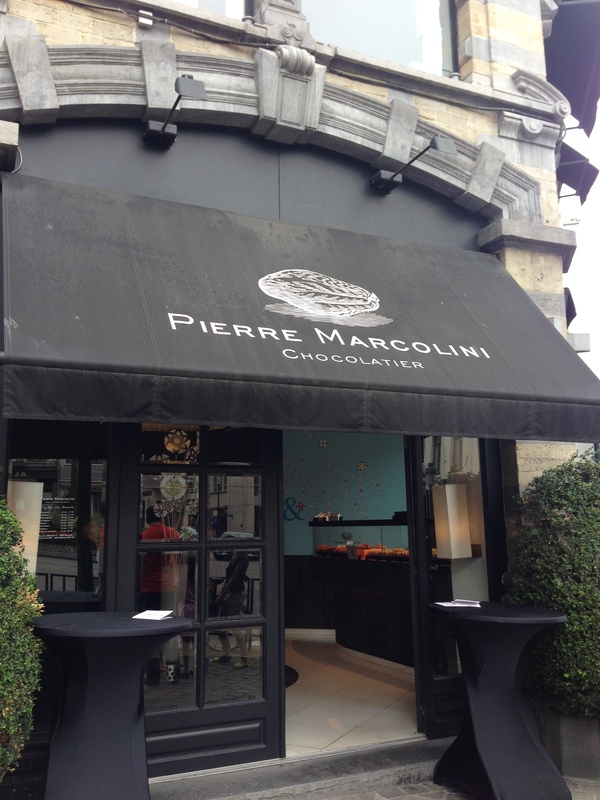 At Pierre Marcolini (across the road), I received a free sample! Champagne Praline. I found it to be soft, complex, and creamy. The alcohol was not too strong. And the powdered sugar on top was a nice touch. My favorite chocolatier, however, was located very close to the train station (conveniently enough). Laurent Gerbaud, at Rue Ravenstein 2. I tried a Venezuelan ganache and a dark chocolate noisette. They were both divine. The ganache was dark and nuanced. The noisette’s thin shell concealed an almost soupy interior, reminiscent of almond butter. Where did I miss? Do you have a favorite Belgian chocolate? P.S. 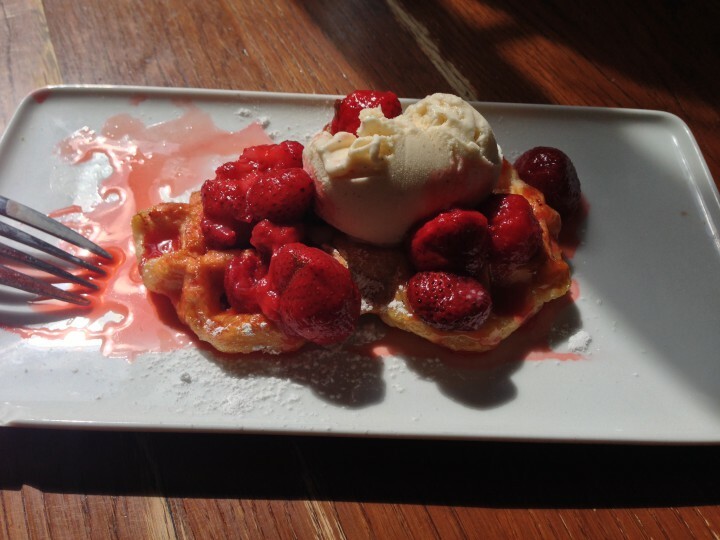 No trip to Belgium would be complete without a taste of an authentic Belgian waffle. After reading a few reviews of waffle houses in Brussels online, I decided on Maison Dandoy – an establishment that has been churning out pastries since 1829. They are also famous for speculoos–a crispy, spicy, buttery cookie made in a wooden mold–and are located on Rue au Beurre (Butter Street). If you make delicious butter cookies, I reasoned, you should be able to make a delicious waffle. Maison Dandoy did not disappoint! Their Liège waffle has permanently altered my sense for a waffle’s potential. It was sweet. Not unlike a croissant, with a soft, doughy texture. Ironically, this waffle may have been my favorite treat on my chocolate quest. Where can they be found in the U.S.? Or do you have a favorite recipe…? Bon Appetit!